In his 30-year career, Kevin Pollak has appeared in more than 60 films and created indelible roles in such modern classics as A Few Good Men and The Usual Suspects. His Internet awakening occurred in 2009, when he started his Streamy Award winning weekly talk show Kevin Pollak Chat Show backed by Jason Calacanis (Mahalo). In his 30-year career, Kevin Pollak has appeared in more than 60 films and created indelible roles in such modern classics as A Few Good Men and The Usual Suspects. 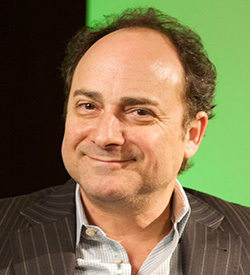 His Internet awakening occurred in 2009, when he started his Streamy Award winning weekly talk show Kevin Pollak Chat Show backed by Jason Calacanis (Mahalo). He ventured into the world of Web video with his acclaimed original Web series Vamped Out (it was his directorial debut and he wrote and starred in it as well). Vamped Out returns for season 2 on Babelgum this fall. In a series of interviews about his projects, Pollak shares the story of his evolution and what he loves about this new entertainment medium. Fast Company: How did Kevin Pollak Chat Show start? During the chat, Calacanis signed me up for Twitter, and I was like, ‘What’s a Twitter?’ And he’s showing me around the offices, and he shows me a small studio that he’d been using to shoot This Week in Startups. In the recesses of my brain, out popped an idea. You know, I’d like to do a Charlie Rose thing, involve the fans–something real, live, no censorship, no time limits. As an actor, I’ve done all the shows back to Johnny Carson. The only one that’s a conversation, the only one without a pre-interview where they ask you what you did on vacation or whatever, is Charlie Rose. Carson was the master, but it was still a performance. Tom Snyder’s old show came close, but still a pre-interview. Bob Costas’s old show came close to a conversation. Jason said to me, ‘You know you said that out loud, right?’ It came out of nowhere. And I wanted to hit the ground with my feet racing. Our mantra from the beginning has been: “We’re Not Ready.” We did a live streaming Twittercast of the Oscars, and we’ve been doing a show almost every week since. FC: What was the first sign that this might be working? KP: After about eight weeks, the LA Times did a front-page, above-the-fold story on us. They found us. We haven’t done any publicity whatsoever. That was physical evidence that we were doing something unique and special. FC: In that LA Times piece and on the show, I’ve heard you allude to how you’ll make money off Kevin Pollak Chat Show. What can you tell me about that? KP: I ask myself, is this something that I enjoy doing? If so, I can’t be that concerned about the notion of monetization. That said, I have thought about the model being the earliest days of television: ‘This hour is brought to you by … .’ The show I was always reference is the old 1950s Colgate Comedy Hour. Who’s our Colgate? FC: That interview you did with Jason Reitman [director of Up in the Air] was really amazing. I got the sense that everyone knew within 30 seconds that this guy got it. KP: When it was over, I told everyone, ‘I think we just shot the pilot.’ That was the first time in 40 shows where I wanted someone to burn a DVD of the interview for me. I’m not sure what it all means. I don’t want to have to explain that magic, that lightning in a bottle, to an advertiser. There’s nothing else like this online. That’s its own reward on some level. People are stopping me on the street to tell me that they love the Chat Show. I said to Calacanis, who’s more machine than man really, ‘I have a weird inkling that this is my legacy.’ To compare that with how to monetize this? It’s kind of ridiculous. So I’m not in a hurry to figure out who my Colgate is. 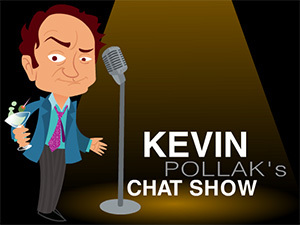 FC: Kevin Pollak Chat Show is distributed via TiVo. How did that come about? KP: TiVo wanted to offer KPCS in its online menu. I’m fortunate to have George Ruiz as an agent. He’s the one everyone is following and continues to be brilliant. I asked him if there’s some relationship to be had. There’s no money in TiVo. He said, ‘That’s not a rabbit you want to chase.’ They want to promote Chat Show, the money is so minimal that it’s not really worth it. He said, ‘I could squeeze them for pennies, but it’s better to just go along with it.’ We’re being offered for free in every single way–our Web site, iTunes, YouTube–it’s hard to ask for money from one channel anyway. It’s bragging rights for us, a new number for us to consider. FC: You’ve talked on the show about building a network with Jason Calacanis. What can you tell us about that? KP: Calacanis’ feeling is, ‘Let’s set up a theme, a very focused milieu.’ He’d been doing This Week in Startups. Let’s bring other talent to the network. We thought about a FunnyorDie model–run millions without care how to get it back. We thought about MyDamnChannel–the HBO route, all the money gets spent on promotion. There’s no way to cover production costs. We didn’t want to be a Web series hub. And a slew of talk shows doesn’t make sense. The template is ‘This Week In … .’ It’s open for every subject. Cars. Games. Literature. Phase one is to see how that goes. Establish the format. See how many interesting people we can gather. Some incredible get from the music world. A total unknown but some geek wizard to do video games. For literature, who wouldn’t want to sit around and listen to this person talk about books? I’m excited about the development phase. Develop a cohesive consistency as a start. FC: You’ve been on this Web adventure for more than a year. Has it been worth it? KP: There’s an utter lack of marketing today. We’re getting as many as 2,500 viewers on YouTube during the show. 10,000 uniques on UStream. Even more on iTunes. It’s growing. Right now, the numbers don’t mean much. We’re creating demand and can’t get too sidetracked by how we’ll make money. It’s inevitable that we will. If there’s anything I’ve learned through my career in traditional media, it’s that you can’t predict anything. So I can’t anticipate when this will pay off. But it will. FC: When will the second season of Vamped Out debut? KP: The “when” is hard to say, as we’re still writing the scripts. I can say that the first season went awfully quickly, though, from pitch to premiere, about 5 months. Best case, we’re shooting in 6 to 8 weeks, it’s only a week-long shoot, then post production for a month, or so, and the second season could premiere as early as, October. Hey, maybe a Halloween premiere… Oooooh… Feel it? FC: Can you give us a bit of a preview of what to expect in season two? And how many episodes are you doing? KP: The story picks up just a week or so after last season ended. Our core characters are back with the addition of a few new ones. The one big difference is that my character, along with our audience, now knows for certain that “Al” is a vampire. Antoon (my co-creator who stars as “Al”) and I received such a great response from our famous friends who saw it and loved it, that we’ve written in several cameos for them. So, because we’re not stupid, there will be more famous faces in season 2, for sure. No, I won’t say which faces just yet. As for how many episodes we’re doing this go around, we’ve written 6 as we did in season 2, but we anticipate that they’ll each be a bit longer. FC: What it’s been like creating a Web series with Babelgum? KP: Honestly, it’s been sort of dreamlike working with Babelgum and Amber J Lawson, in that we’ve basically had more creative freedom and control than anything I’ve worked on in my entire career. It’s why we came to the Web with this idea. I’ve been a member of the Writers Guild since ’87 and have just had too many experiences with the studios and broadcast networks and their savant like ability to find the heart and soul of what makes the script utterly original or funny or just special and then add water to it. They are GENIUSES at it, really. I came from stand-up comedy, where I’ve always had total creative freedom and control, but I’ve never found it in traditional media. Amber J, who “got” what we were after with this, offered minimal notes, all of which we’re helpful, quite frankly. The complete “hands off” support we received from her is what made the experience one of the best of my creative career. FC: Do you think more of your peers will follow your lead into Web entertainment? KP: I absolutely know that more series like ours are coming straight to the Web. Since I started my online talk show–Okay, yes, the 2010 Streamy Award winning Kevin Pollak’s Chat Show. Geez–I’ve spoken with a ton of people who are famous in traditional media who are now VERY into the freedom and control that is afforded them when creating original content for the Web. I’m happy to go on record as saying that this is “that moment” for us in this brave new world, like it was for TV in the late 40’s, when radio and film we’re scoffing at the notion of a new medium. Of course, like TV, that blink of an eye takes about three to five years. The new phase of brands being creatively involved and financially supportive with the Internet networks as well as the writers/producers/directors/ actors & actresses, i.e., “talent,” is quite new on the scene, and it will make the leap to the next level of awareness and success happen like it did for TV.